Fundraiser by Hunter Stark : The Expenses of Dying: Zombi. 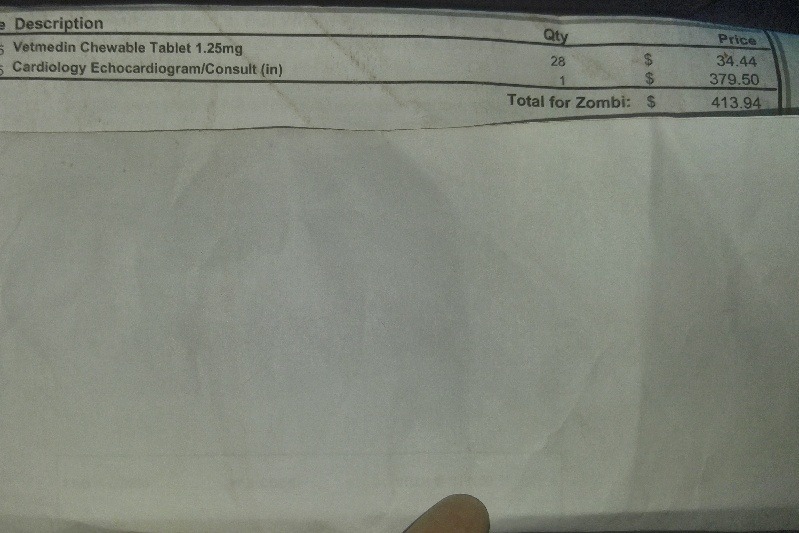 The Expenses of Dying: Zombi. Thirteen years ago, I adopted her from the Dumb Friends League. She was three months old. She was my emotional support cat before 'emotional support cats' were a thing. She was always there when I needed her, leading me out of the dark places inside my own head. Easing my anxiety. Easing my pain. She had a purr she only did when I had a migraine. It was soothing, and it really did help. She was beyond special. She saved my life more than once. Naturally, I would do anything to save her life. It was the least I could do. On Christmas of last year, she developed a cough and refused to eat anything--even her treats. Zombi loves her treats. She never refuses her treats. 1. She has a grade three heart murmur. 2. There appeared to be a mass near her heart. 3. Her right lung was partially non-functional. 4. Her BUN and Creatinine were very high. We admitted her for IV therapy, and discussed what to do about the mass. They couldn't do a biopsy there because of where it is, and, well, there's a risk with sedation in cats with kidney disease. Her kidney values dropped with IV fluids--which couldn't be given too quickly, thanks to her heart murmur. We brought her home on the 27th. 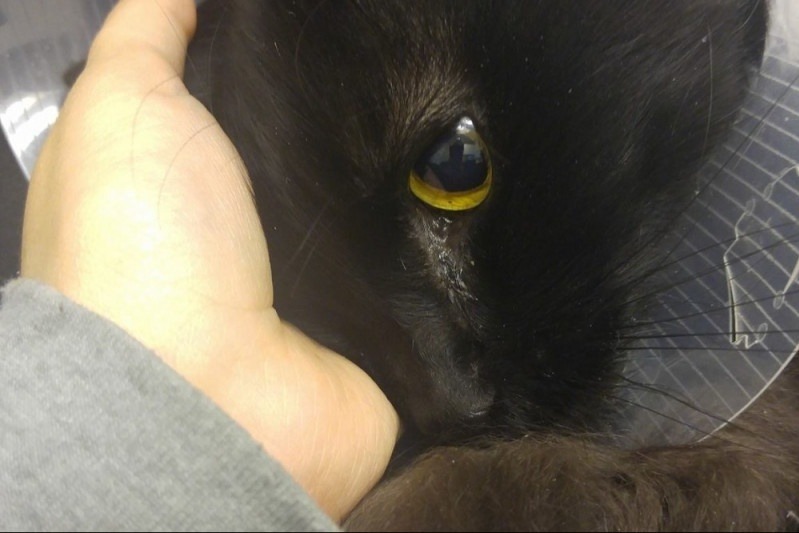 One of her pupils stopped responding to light, so we got her on a blood pressure medicine. A mass started to develop on her eyelid. We got a biopsy. We continued fluids until January 18, when we were finally able to see the cardiologist. We left with a new prescription, a diagnosis of hypertrophic cardiomyopathy with slight pericardial effusion, and an order to discontinue fluids and follow up in a week. Then, we got the cancer diagnosis, an eternity after a slide was made from a biopsy of the mass on her eyelid. A kindly-voiced vet delivered the results of her latest blood work. Kidney values climbing. WBC over 50,000. The cancer was killing her. Paraneoplastic syndrome. So I did. It was the least I could do for her, after all the times she kept me comfortable. The years of fighting with the VA. The years where I fell through the cracks, when my old therapist retired and I wasn't assigned a new one. I fed her with a syringe. I gave her the meds that weren't doing any good. I gave her painkillers. I brushed her. I kept her comfortable until January 31st, when 'comfortable' was no longer an option. 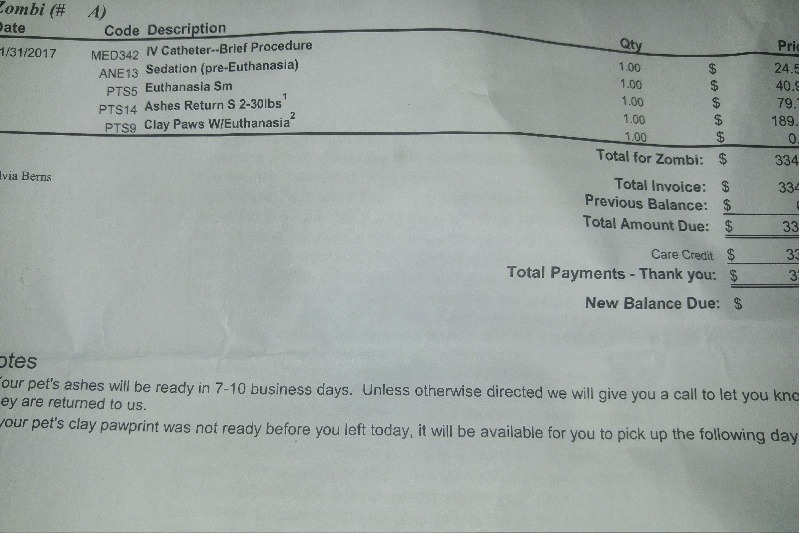 The amount listed will go to covering her medical bills, and her final appointment. Thank you for helping me with this unexpected burden. Zombi was born right around now, too. We don't know exactly when, because she was found as a very small kitten on the streets, so we just guessed. I hope I gave her a good life. I wish I could have given her a better death. At least I gave her a forever home. Spend a little extra time with your pets today. Play with them. Cuddle them. Give them a treat. Because you don't know what tomorrow will bring. Doing a little more cleaning. Getting closer to the corner where Zombi preferred to sleep in her last days. I remember this. This is where the slide began. Where we knew we were looking at 'months', not 'years'. I never had to refill that prescription. I was cleaning a bit--it's trash day--and I found this between the bed and the night stand. I have video of it that I've never watched. I don't need to. I remember. I mean, I did. I knew that Zombi made me feel better. That, just by existing, she kept the darkness at bay. Every day, she saved me. As great as El and Morti are, it takes both of them to do what she did by herself. Help me out, if you can? Help me get rid of this monthly reminder that I couldn't save her.